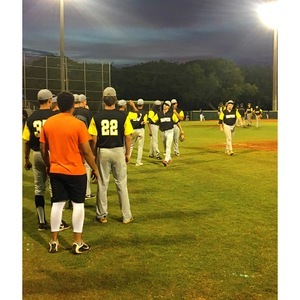 In the opening round of the SFCBL playoffs the Snappers squared off against the three seeded Palm Beach Xtreme. On a Friday night under the lights wearing an alternate black on grey uniform for the first time all season the boys were ready to make some noise. These were undoubtedly the two hottest teams entering the playoffs as the Snappers snuck in winning their last three while the Xtreme won their final seven games of the season.
" We knew we had a tall task ahead of us as the Xtreme are a power house in this league every year, not to mention they were throwing their ace Portorreal who has over 80 K's this summer," said GM Ryan Lamb after the game. The Snappers found out quickly just how good their opponent was as he struck out the first three batters of the game. The West Boca team was confident in their starter Dylan Drawdy from Southeastern University as well. "Drawdy is an experienced guy who's going to go out there and compete to give his team a chance to win every time he steps on the bump," says pitching coach Julien Soucy. Drawdy got into a bit of jam in the bottom half of the first inning but was able to work out of it thanks to a key double play on questionable base running from Xtreme OF Connor Rowland. After that inning Dylan was able to really settle in and leaned heavily on his slider throughout the game. His final line of work was 5.2 innings giving up 1 run on 6 hits with 7 K's to only 2 walks. "That was a great hitting team and his slider was electric tonight keeping them in check," coach Soucy said of his starting pitcher. As for the Snappers offense they were able to scratch a run across in innings 2,3 and 4 chasing Xtreme right hander Portorreal after just three complete innings of work. They did so behind key hits from Parker Stephens, Ricky Gonzalez and Harold Marte along with some help from the Xtreme. Coach Doug Jennings's Xtreme played uncharacteristically sloppy in the middle innings making four errors which led to three runs. They would manage to push two runs across of their own but Snappers closer Jonathan Ripoll came in to throw the ninth and pick up the save. In an interview after the game head coach Ross Smith had this to say, "We said it before the game that it doesn't matter who the better team is, it just matters who the better team is tonight; and for this game the better team was us." The Snappers picked up their first postseason win in franchise history 4-2 behind scrappy offense and gritty pitching. The player of the game would have to go to center fielder Jared McKay from the University of New Orleans. As he went 2-5 and made two outstanding diving catches on the warning track keeping multiple runs off the board. The Snappers would face the number 1 seed Pompano Beach Clippers the next morning and fall 8-2 in that match up ending their 2017 season. The Clippers went on to win the league championship the following day.